Eight startups will go head-to-head at the second annual Startup Pitch Competition at next month’s TiECON Florida, and the deadline to apply is coming up fast. Lakshmi Shenoy: CEO of Embarc Collective, the Jeff Vinik-backed Tampa Innovation Hub opening in March. Conrad Syzmanski: Past President Bealls Outlet Stores, Active Angel Investor affiliated with Bridge Angels in Sarasota, FAN Fund in Orlando, Florida Funders in Tampa, and Tech Operators in Atlanta. Diana LaTour: Operating Partner for LFE Capital And Managing Partner of LaTour & Associates. Kannan Sreedhar, a member of the TiE board and past program chair, says the judges will be looking at several criteria in choosing the winning startups. Finally, he added, they want to see passion and commitment, along with a clear vision of what each startup hopes to accomplish. The top three startups will have the chance to pitch for funding at an upcoming TiE Angel Forum. They’ll also have the opportunity to have their elevator pitch shared with the TiE Angels Alliance, which includes more than 3,000 charter members in TiE chapters worldwide. Pitch-ready startups can submit their applications here. The deadline is January 20. For Sreedhar, corporate consulting director at Avaya, the winning startups aren’t the only ones who will benefit from the competition. In addition to the pitch competition, TiECON Florida conference goers will have the opportunity to attend panel discussions, educational programs, and networking sessions. Five businesses leaders who were instrumental in impacting local entrepreneurship will also be recognized at an awards ceremony hosted by entrepreneur and philanthropist Dr. Kiran Patel and TiE Tampa Bay president Suhas Apte. Synapse Summit, a two-day event highlighting Florida’s growing presence in global innovation and technology, is coming up January 23 and 24 at Amalie Arena. Events include live demos, speakers, breakout sessions and networking opportunities. Read more about it here. 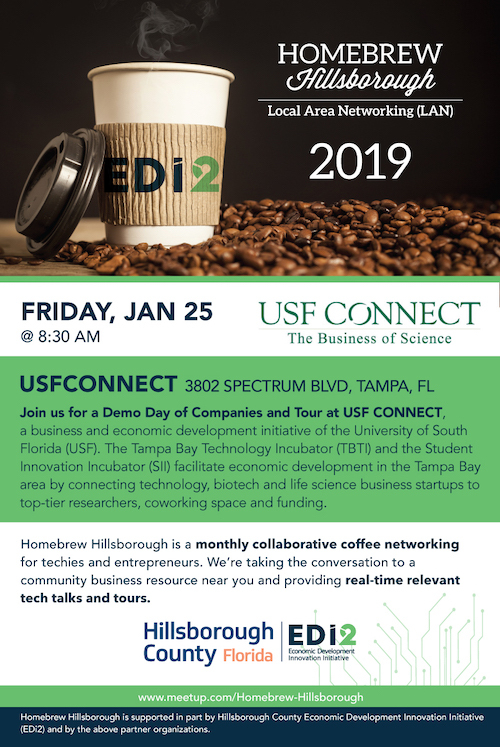 Homebrew Hillsborough, a local networking group for entrepreneurs and techies, meets Friday, Jan. 25, at 8:30 a.m., at USF Connect, 3802 Spectrum Blvd, Tampa, where they will see a demonstration of local startup companies and take a tour of the facility. The Florida Venture Capital Conference will be held at the Vinoy Renaissance Resort in St. Pete January 31-February 1. Jeff Vinik, owner of the Tampa Bay Lightning and developer of Water Street Tampa, will be the keynote speaker. Techstars Startup Week Tampa Bay, a five-day event that features educational sessions, collaboration opportunities, and presentations by business leaders and entrepreneurs, runs February 4-8. The event, now entering its fifth year, encourages connections and celebrates the achievements of startups from around the Tampa Bay area. Read more articles by Jaymi Butler. Jaymi Butler is a writer and editor who enjoys telling the stories of growth and innovation in the Tampa Bay Area, which she has called home since 2003. A former reporter for the Savannah Morning News, The State, and The Tampa Tribune, she has covered a variety of topics ranging from business to features to public health -- and she even got to sit in on an American Idol audition just feet away from Simon Cowell!